This is a film that has sat on my shelf for far too long. Christmas 2011 I believe. Anyway, after a small amount of deliberation with the misses, we decided to make it the next film on the Random Horror watch list. I am going to do this slightly differently because of the nature of the film. In actuality, it’s not really a film. Rather a collection of 4 tales of Halloween woes. 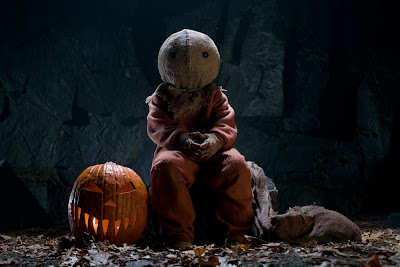 The connections being the setting (all in the same town) and Sam, a tiny trick or treater in an orange suit with a burlap sack over his head reminiscent of a jack-o-lantern. Although characters do appear in differing stories at differing levels, the main connection is Sam! In what plays like a ‘horror-stories-around-the-camp-fire’ sort of way, we weave in and out of story arcs as the film runs. The opening, being a stand-alone story which sets the tone for the film sees Emma and Henry returning home from what has obviously been a fun-filled evening in full costume. Emma begins to tidy up the OTT garden decorations but soon falls foul of a Halloween trick! From here, we are taken to an earlier setting and the first of our four treats! 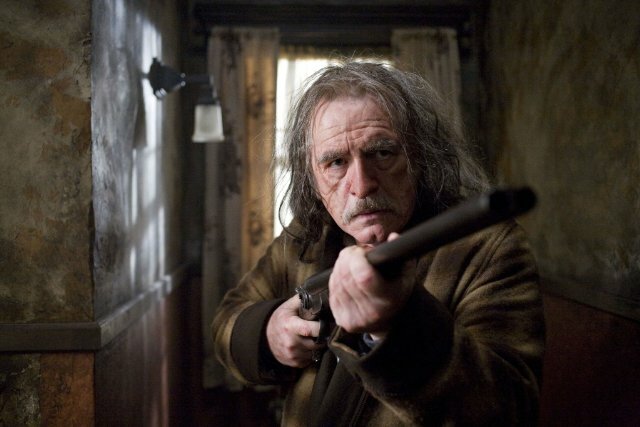 the principal himself is as sinister as he is clumsy and definitely naive to boot. His taste for Halloween tricks will undoubtedly bite him in the arse later! 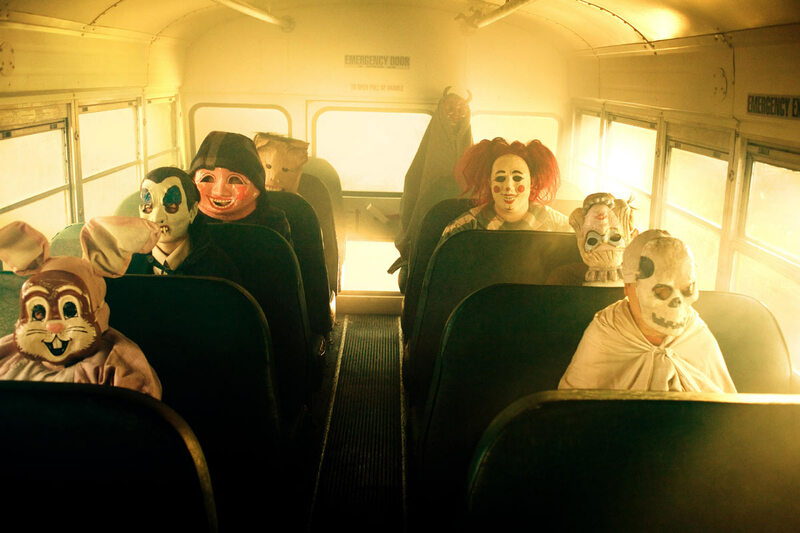 The second story sees a group kids travelling to a local rock quarry regaling tales of murderous pasts involving a school bus full of unfortunate kids. The kids had supposedly met their doom at the bottom of the quarry one fateful Halloween night. A Halloween prank which goes horrendously wrong proves more than enough for the kids’ enjoyment. Thirdly, we follow a group of girls getting ready for a party. Laurie, Danielle, Maria and Janet are all set for a good night. Laurie, being a shy girl stays behind a while. She is later prompted to join the group in the woods. While travelling to meet them, alone, she is joined by someone else and all hell breaks loose in what is probably the most fun segment of the film! The final short comes in the form of the grouchy neighbour of Principal Wilkins, Kreeg! As we had heard from the principals own segment, Kreeg is a bit of an irritable, cantankerous old man whose dislike of Halloween is fairly obvious. Following on from the parts we had previously seen, Kreeg does battle with Sam the pumpkin boy in his own home with varying levels of success. The whole thing is wrapped up nicely as we see most of the pieces of this Halloween jigsaw fall into place before our very eyes! As Halloween themed films go, this one is really enjoyable. The list of themed films admittedly isn’t great but I would have to put this somewhere near the top end. 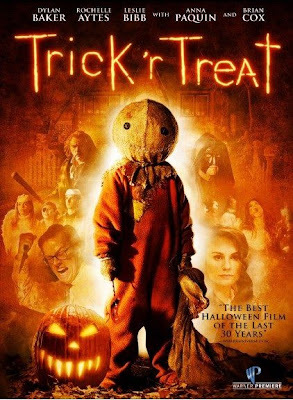 A stella cast ably perform their roles throughout as we are taken into a world of Jack-o-lanterns, costumes, girls, death, zombies, vampires, werewolves and anything else the horror genre can associate with the favoured holiday! The able cast of which I speak are also fairly familiar faces with Dylan Baker as Principal Wilkins who is just creepy and Anna Paquin playing the shy, retiring virgin is a brilliant twist on what follows! The always brilliant Brian Cox providing the grouchy neighbour with a secret is another great casting move. As for atmosphere... Well, when you have so much dry ice floating around, the kind of comic-book style atmosphere that was clearly the target is easily achieved and very effective. While the film may fall ever so slightly into the tongue in cheek category as a result, what it lacks in real horror and scares, it more than makes up for it with its own brand of black comedy and drama. While reading some background information, I noticed that no official cinema release was given and baring a few small screenings, it was released direct to DVD in 2009. It seems such a shame that films of this calibre find it difficult to get a general cinema release when some of what Hollywood puts out is so poor, it begs the question why bother!? On the whole, Trick ‘R Treat is an enthrallingly entertaining and an all round enjoyable watch. I would definitely recommend to anyone looking for a fun filled film to enjoy on any random horror night, not just on October 31st!